For months now I've urged you to pray for my friend and partner in ministry Chuck Obremski. Thanks for standing with us in your prayers. Now I "beg" you to lift up someone else who is much closer to home, Tommy Garrett. Tommy lives here in our rural area of Cavan, Ontario. The following article in the Peterborough This Week newspaper, written by Lauren Gilchrist, is a plea for the public to get involved in helping to save Tommy's life. Time is of the essence at this point. Tommy and his mother need to get to Calgary for treatment in the next few weeks. What can you do to help? We can't stand idly by! Clad proudly in a Detroit Red Wings baseball cap and his pajamas, 17-year-old Tommy Garrett sits outside his Cavan home that overlooks the tranquil country side and rolling hills. This is one of the rare days Tommy has spent out of the Sick Children's Hospital in Toronto. "I know I'm certainly not ready to give up," he says softly, but with determination. "I just want to get better," he says. "Get back my life and play hockey." Although there is still a spark of hope in his eyes and a faint smile, Tommy's physical state is frail and continues to deteriorate. "Tommy feels like he has been fighting a playoff battle for three long years," says his mother Sandy Johnston, trying to suppress the emotion rising in her voice. "In terms of his health, we feel that we're fast approaching the sudden death playoffs. Although time is running out, I am convinced that with the community's help, Tommy will get back on the ice with his goaltending pads as soon as possible." For Tommy, the last time he played hockey, his favorite sport, was three years ago. The past three years have been spent in a constant battle for his life. Although deathly ill, Tommy still dreams about playing hockey and one day meeting Red Wings captain Steve Yzerman, a former Peterborough Pete. "I've just always been in love with the sport," he says. 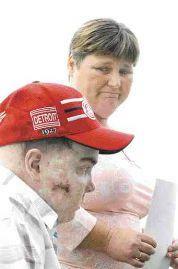 Tommy received a bone-marrow transplant on June 13 from Windsor resident Ron Giles to help him recover from his cancer. However, his body rejected the bone marrow and he now suffers from Graft Versus Host Disease (GVH). This new assault on Tommy's body causes painful skin lesions that, left untreated, are life threatening. Although the Ontario Ministry of Health and Long Term Care has agreed to fund his special and life-saving treatments, called Photopheresis, officials have not agreed to pay for the cost of transportation or the family's six months of living expenses. Because she has spent the past three years caring for her son, Ms Johnston has not worked. The farm family was also severely set back financially by the border being closed to beef exports, which resulted in the selling off of its remaining cattle. "We wanted to thank everyone for helping Tommy," says Ms Johnston. "But time is running out and we really need to get Tommy to Calgary. "Tommy's family, friends and supporters are asking the citizens and community leaders of Peterborough to rally behind the teenager and help raise the necessary funds he needs to get to Calgary. The family is making a special appeal to the NHL foundation and the NHLPA's Hockey Fights Cancer' program to identify ways they can help. Thanks for the informative post, keep up the good work!